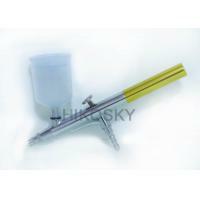 attached to the body of the airbrush, and then it is mixed with air and sprayed by the pressure of an air compressor or compressed air tank via an air hose. This model is perfect for detailed job, it is usually used together with our mini air compressor (HK-100, HK-215 etc) for tanning, and tattoo application. Beautiful Chrome plated body build, solvent resistant seals, rust free needle system, smooth trigger, and excellent paint air mixture flow. This model can also be made for single action type. The handle is golden color, which makes it more deluxe, and there are also other colors for choice, such as silver, and you can also choose adjustable rear handle. There are two plastic cups for this airbrush gun, one is 20cc, the other is 40cc, you can use either of them according to your needs. 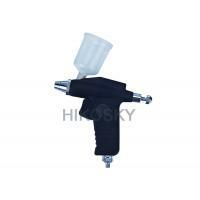 This airbrush gun is double action type, which means: By pressing down the operation lever you can regulate the airflow, by turning it back (at the same time) you can regulate the paint volume. 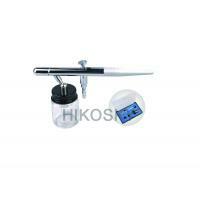 By activating the control lever downwards, the compressed air flows forwards, out off the needle cap. By pressing the control lever backwards, the paint comes out of the nozzle and is sprayed on the object due to the air pressure. The more the control lever is backwards, the more paint is sprayed. Suitable for body tanning, and body tattoo.